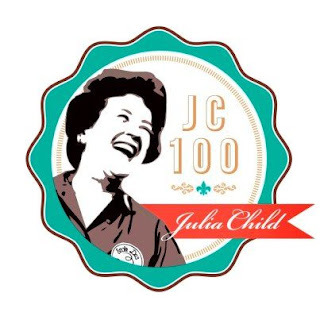 Tomorrow the world celebrates the birthday of an iconic chef – Julia Child. Had Julia still been with us today she would have been celebrating her 100th birthday! Sadly Julia died in 2004, of kidney failure, just two days shy of her 92nd birthday. For those of you who don’t know, Julia Child was an American chef, author, and television personality, famous for introducing French cuisine to the American people, with her debut cookbook, “Mastering the Art of French Cooking”. I admit, before watching the movie “Julie and Julia” I didn’t know who she was. Her TV show, “The French Chef”, premiered in 1963… Just a little before my time ;o) The movie is based on two true stories. One of Julia Child, and the other of Julie Powell, who assigns herself a project to cook all 524 recipes from the cookbook “Mastering the Art of French Cooking” in 365 days, and blogs about her journey. Julia Child and her husband Paul, moved to Paris just two years after their marriage. 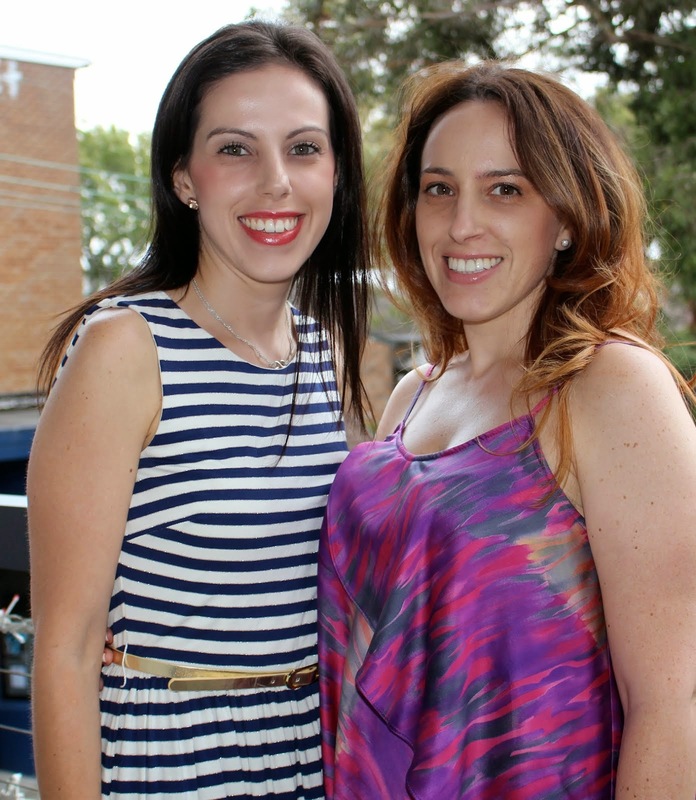 While Paul worked, Julia struggled to find something to fill her time with that she enjoyed. She soon decided that she would attend the famous “Le Cordon Bleu” cooking school, to learn how to cook. Cooking came naturally to Julia and she soon became in love with it. She had discovered her passion and was fearless in the kitchen! Along her travels Julia met Simone Beck, who was writing a French cookbook for Americans with her friend Louisette Bertholle. And together the three women wrote a book about French cooking for Americans – “Mastering the Art of French Cooking”. So in honour of Julia Child’s 100th Birthday I have decided to try one of her recipes. After a lot of thought I decided I would make ‘Boeuf Bourguignon’. 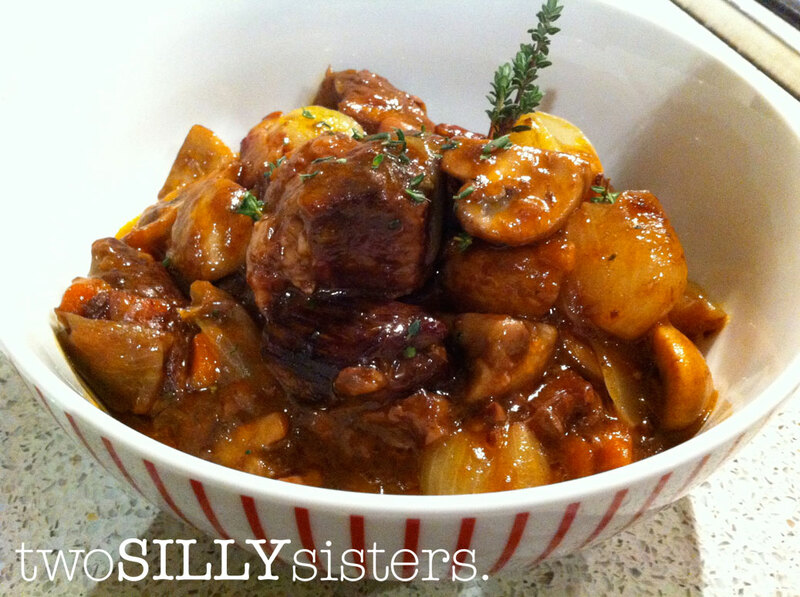 A traditional French beef stew, slow cooked in red wine. This was also the very first dish that Julia Child prepared on her TV series, “The French Chef”! But after watching the original cooking show (see clip above), doing a bit of research, and finding the original recipe from "Mastering the Art of French Cooking", I was nearly ready to give up before I even started! There are a lot of steps involved and it seemed more complicated than I had originally expected! But nonetheless I pulled myself together (before I had a Julie Powell kitchen breakdown, like in the movie Julie and Julia) and decided I was going to tackle this! And I’m so glad I did! The end product was absolutely delicious and the whole kitchen had a gorgeous smell of wine and herbs. 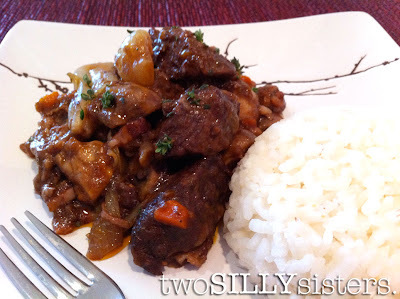 The dish was a perfect hearty winter meal and I’m sure I will make this again. Traditionally this is served with boiled potatoes, however I opted for a side of steamed rice. You can make this a day ahead of serving, and supposedly freezes well too. So here is my gluten free and simplified version of ‘Boeuf Bourguignon’. In the words of Julia Child, Bon appétit! Recipe adapted from "Mastering The Art Of French Cooking" by Julia Child, Simone Beck and Louisette Bertholle. 1. Preheat oven to 150°C. Dry the beef cubes in paper towels (they will not brown if damp). 2. Heat the olive oil in a medium sized frypan until hot, and fry the pancetta for 2-3 minutes to brown lightly. Remove to a side dish. 3. 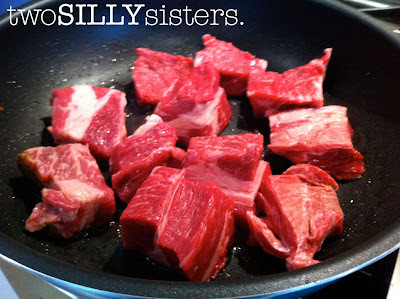 In the same pan, fry the beef, a few pieces at a time, until nicely browned on all sides. Remove to a side dish and then fry the carrot and onion until brown. 4. Place the pancetta, beef and vegetables into a heavy-based casserole dish, and season with salt and pepper. Sprinkle with cornflour and toss to coat the beef. On a medium heat keep tossing for 1-2 minutes more to lightly brown the flour. 5. Add the red wine and enough beef stock so the meat is barely covered. Add the tomato paste, garlic and herbs, and bring to the simmer. 6. Cover the casserole dish with the lid and set in the lower third of the oven. Allow to slowly cook for 2 hours. Keep an eye on this as each oven varies cooking times. The meat should be easily pierced with a fork and a thick gravy should bubble around it. 7. Whilst the beef is in the oven prepare the onions and mushrooms. To easily peel the eschalots, place in a bowl of boiling water for a minute. Remove and cut off the root side, the skin should then peel off without a problem. Leave them whole. 8. Place the eschalots in a saucepan and half cover with water. Add butter and salt, and bring to simmer. Cover and cook for a further 20 minutes or until tender. 9. 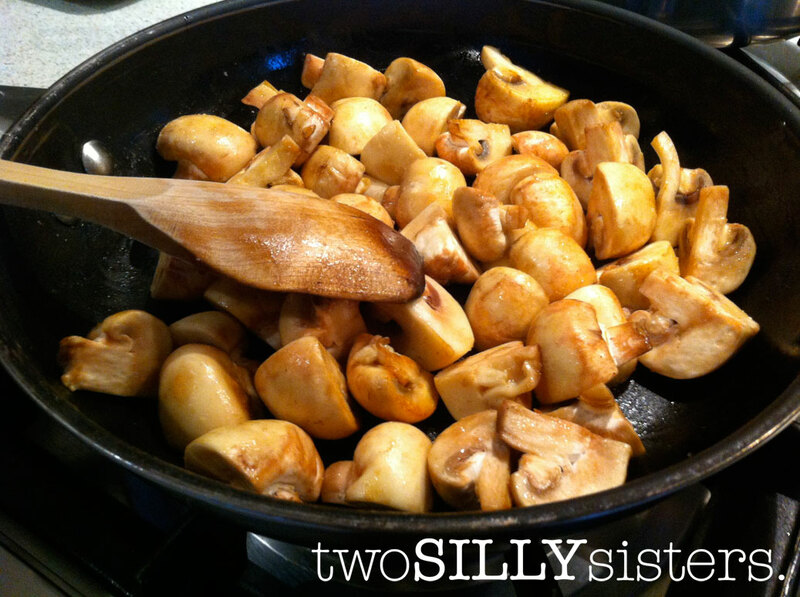 For the mushrooms, heat the olive oil and butter in a fry pan until hot (the butter is hot enough when the butter foam subsides). Add the mushrooms to the pan and season with salt. Sauté for 2-3 mins or until lightly browned. 10. 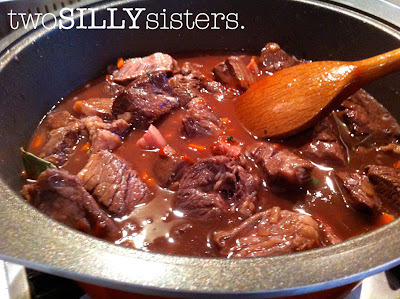 Once the beef is tender remove casserole dish from the oven. Skim the fat off the sauce, which may have risen while cooking. 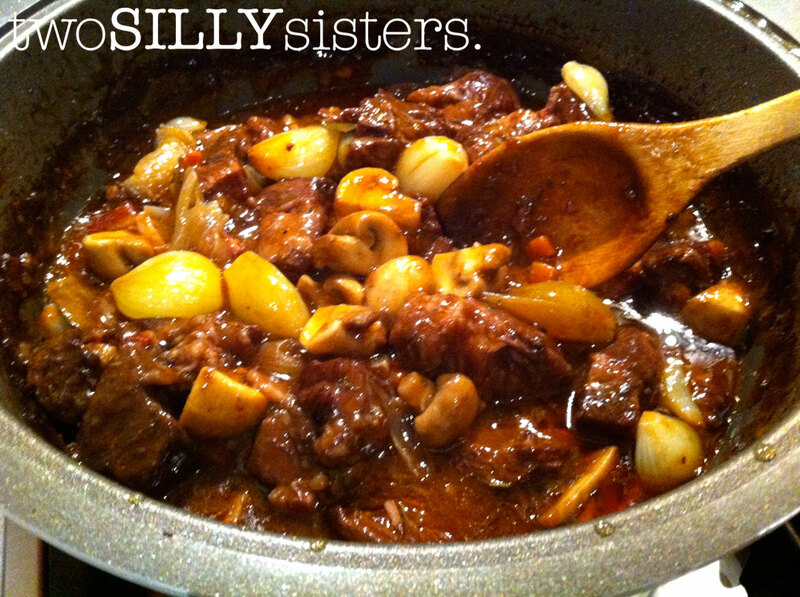 Add the cooked onions and mushrooms to the meat, and simmer over the heat for 2-3 minutes. 11. Serve with potatoes or rice, and a full-bodied red wine. Serves 6-8 people.